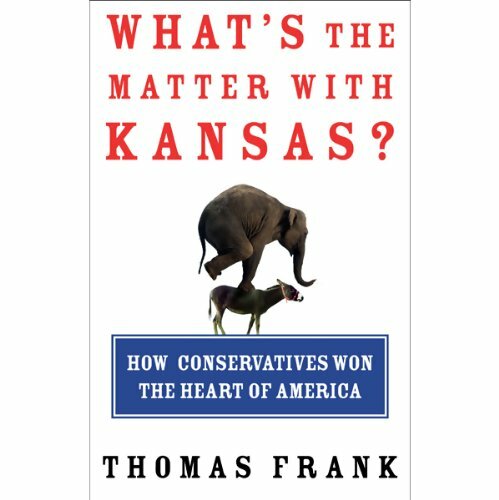 In this lecture, Thomas Frank distills the central argument from his New York Times best seller, What's the Matter With Kansas?, which unravels the great political mystery of our day: why do so many Americans vote against their economic and social interests? In this special recorded lecture, Thomas Frank answers the riddle by examining his home state, Kansas, a place once famous for its radicalism that now ranks among the nation's most eager audiences for a backlash that he calls a "derangement", the popular revolt against a supposedly liberal establishment. In his concise, reasoned approach, Frank charts how the "great backlash mobilizes votes with explosive social issues", marshalling cultural anger to achieve economic ends. As a result, conservatism, once a marker of class privilege and now the creed of millions of ordinary Americans, has become a "working class movement that has done incalculable harm to the middle class". This lecture was a good summary/teaser of the book itself, but I wish Audible had an unabridged copy of the book available for purchase. Unfortunately, we lost in 2016. We got complacent and forgot about the working class. Let's not forget that we have the right economic policies to move this country forward. The Fight Continues. I enjoyed this brief social commentary and feel it has much to tell us about America as Election Day looms. I just wish the complete book was available in audio format. I read the book and listened to the lecture and found both to be very informative. It was baffling how people in middle American could seemingly vote against their own self interests and this book explains it. It will definitely give you a perspective on how this can take place. The only factory closes in town with now hope of jobs anywhere without moving and other family losing their farms to a conglomerate and yet they still vote for the people that put them in that situation. Incredible. Completely opened my eyes and made me realize the gulf between Moderate Republicans and Radical Conservative ones. Highly recommended reading! "Kansas" is well worth the money. Franks does a great job of explaining how the latest Republican Revolution came to be. He tells how it works. He doesn't, however, have a lot of ideas for how to counter it. For that I would suggest George Lakoff's "Don't think of an Elephant!" and "Moral Politics." I suspect that Steve is projecting his own anger onto Mr. Frank because he disagrees with what Mr. Frank says. The very definition of brainwashing is that the subject rejects reason in favor of the party line. This book is well written, thought provoking and a good listen for any thinking conservative or liberal. For those reviewers who cannot but wish to silence this book, consider why they are so angry. The fact that this book provokes so much emotion in sheep is testament to its truth. Listen to this book. I think you will find it well worth the price of the download. (Is it wrong of me to want to download this book directly into the hearts and minds of the sheep?) (or would that make me like them?) (hmmmm). Thomas Frank explores the modern conundrum: why do people vote against their own self-interest? Mr. Frank was raised in Mission Hills, Kansas the tony suburb of Kansas City, Missouri. The insights he brings to this work are the product of a lifetime's experience. Beginning with the Populist movement of the 1890's and exploring the mechanism behind the shift in the popular perception of policy. Mr. Frank interviewed Kay O'Connor, the state rep. from Olathe who made the national press by declaring that women's suffrage was a factor in the moral decay of the nation. Mr. Frank makes the state legislator's paradoxical position on women and the universal franchise understandable. He explores how the electorate embraces a female legislator opposed to women voting and why they return O'Connor to the house when she opposes public education, evolution, unions, a progressive income tax and abortion. A fascinating bit of reportage and well worth the time. Mr. Frank should record his whole book! Great lecture! I'd like to hear the entire book. I always wondered why some Americans are on the verge of voting themselves into becoming third world serfs. It explains why poor, middle and lower middle class people Ameicans are willing to play the fool for politicians who tell them what they want to hear about social issues yet the very first legislative bill they sign deals with bankrptcy, tort reform and kickbacks to energy companies. A fool and his money will surely part.